The Pontsteiger building rises up to a height of 90 m above the waters of the Houthaven port, making it one of the tallest structures in Amsterdam. 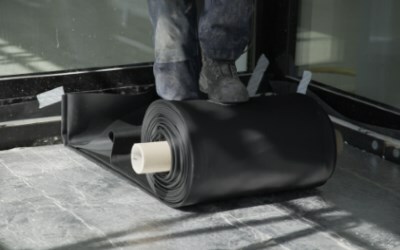 To ensure a waterproof, air-tight building envelope, HERTALAN® EPDM products were used for waterproofing façade and walkways. On Amsterdam’s western waterfront, what was once a lumber port is undergoing a similar transformation from an industrial location into a popular waterside residential district. Where timber was once loaded onto freight liners, a vibrant green urban district is now part of the landscape. Around 2,500 flats, 70 berths for houseboats, plus schools, restaurants and cafés will be built by 2020. Another visible landmark in this new district and an eye-catcher in Amsterdam’s skyline is the 90 m tall Pontsteiger residential building, designed by the local architectural firm Arons & Gelauff Architects. 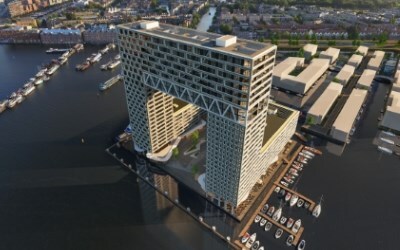 The XXL residential building is prominently positioned in the new district: at the end of a 200 m long dam in the heart of the Houthaven, the point where three ferry lines connect the districts of Amsterdam via the waters of the River IJ. Appropriately, the Dutch word “Pontsteiger” means “ferry terminal” in English. Each of the 318 Pontsteiger flats has a walkway. The Pontsteiger building’s façade structure consists of multi-layered concrete elements with matching walkway surfaces. The large-scale sandwich elements were all prefabricated and then installed on site. There is a marble white concrete grid with a playful pattern encased in the outsides of the façade, complemented by the bricks hand glazed in green and bronze shades. The interplay of colours is reminiscent of a chameleon, as it creates a façade that has different shades and hues depending on the light and time of day. “Depending on the sun’s position, the façade has a different green to golden shimmer,” explains Arnoud Gelauff, an architect. It is this golden glow that earned the gate-shaped building its nickname: Golden Gate. A multitude of windows and the walkways’ glass fronts are arranged across the large sandwich elements. To meet the energy requirements, the façade-side concrete elements aren’t just fitted with internal thermal insulation layers; the joints between the elements and the ones connecting to the integrated window areas had to be designed to be air-tight and windproof. 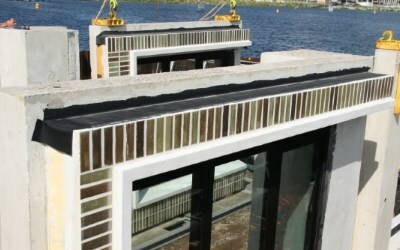 The window frames were framed with HERTALAN® EPDM strips during prefabrication for this very purpose. 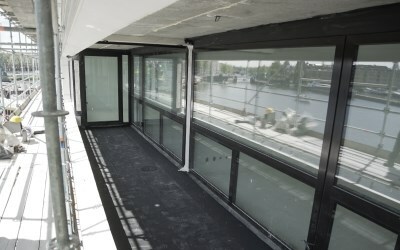 Prefabricated HERTALAN® EASY COVER EPDM sleeves and waterproofing membranes were used between the elements and the ones connecting to the integrated window areas had to be designed to be air-tight and windproof. 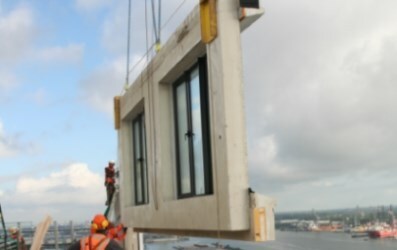 The window frames were framed with HERTALAN® EPDM strips during prefabrication for this very purpose. To conclude, this large scale project once again showcases the versatility and flexibility of EPDM membranes on facades and walkways. 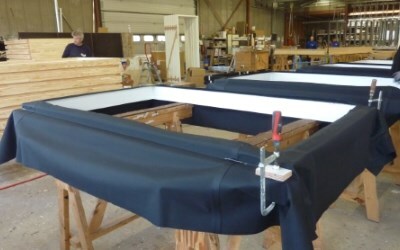 With made to measure sheets makes the installation fast and efficient both flat roofs, facades and landscape.